Best feature of this watch is the size, weight and heft provided by the coin and the alloy metals. Classy appearance. Quartz movement is a little sloppy to set, watch face is simple, but overall, and attractive timepiece and an excellent value in this price range. The conductor checking his Railroad Watch as the train begins to move is a nostalgic scene from America's past. 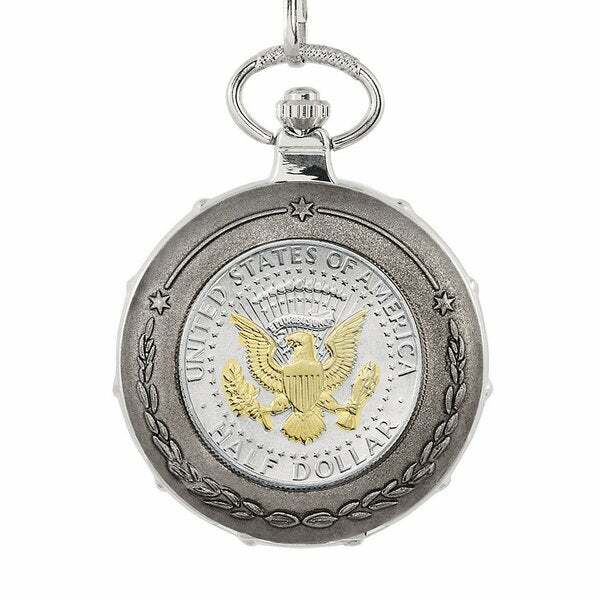 This familiar and romantic image is captured in the design of this beautiful silvertone railroad pocket watch. The back of the hinged case features a highly detailed relief sculpture of an historic Iron Horse locomotive. The front frames an authentic U.S. Half Dollar. Dimensions 2 3/4" x 1 7/8" x 1/2"
I bought this for my elderly neighbor for Christmas and he loved it. I didnt expect something as nice as it was being so reasonably priced!! I like the poker watch. I would tell my friends. this was a gift for my picky son and he really like it. Very good looking and well made. Worth Owning. "Does ts watch come with just regular numbers on the face or Roman numerals??" "What's the date of the coin used in the watch because when you open it you will be able to see the date"
The date of the coin will vary from watch to watch. The date range is 1971 – 2016.